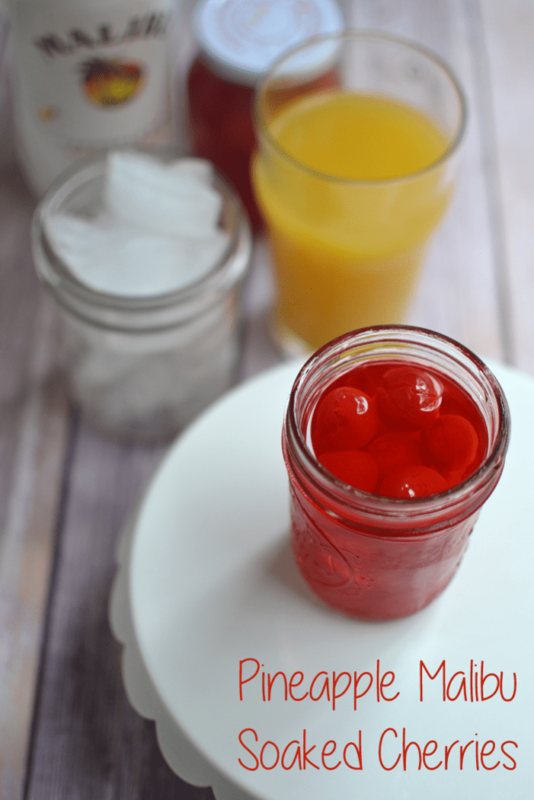 I’m back with another cherry recipe today. 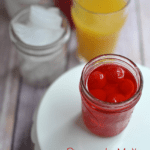 Monday I shared a Maraschino Cherry Cake recipe and today I am sharing a cherry recipe for adults only – Pineapple Malibu Soaked Cherries Bombs! On Christmas my mother-in-law passed around chocolate covered cherries that had been soaking in alcohol (sorry I don’t know if it was Jim or Jack) but they were like an explosion in your mouth. I am a lightweight so a few of those babies and I wouldn’t have been able to drive home. I am more of a fruity beverage person with Malibu rum being one of my favorites. I decided to make my own little cherry bombs soaked in Pineapple Malibu and they turned out so good. I have been using them to garnish my drinks but you can also take one out of the jar and eat it… if you dare! My mother-in-law said she uses the alcohol left from soaking the cherries and splashes it in her Coke or Sprite for adult cherry sodas too! I thought that was a genius idea! Grab a fruity soda and it is game on! Take your cherries and put them into a jar without the maraschino cherry juice they come in. Fill the jar with pineapple Malibu and place in the refrigerator. Leave the jar for weeks or longer until they are soaked and full of flavor. **My mother-in-law said she soaks hers for about a month. I think any amount of time would be find the flavors just won't meld as much. Go make yo’self some cherry bombs! Eat them at the beach, my the pool, when it’s cold or hot!